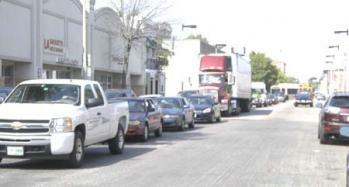 City Hall takes aim at Glover’s Corner gridlock "disaster"
Traffic mess: Cars and trucks were stacked up at 2:15 on Tuesday on Dorchester Ave. southbound near Glover's Corner.City Hall is seeking ways to remedy the traffic troubles plaguing the intersection at Dorchester Avenue and Freeport Street, also known as Glover’s Corner. City Councillor Maureen Feeney called the intersection a “disaster” and said Boston Transportation Department officials are working to fix the problem. “It’s hard to believe one intersection has caused so much trouble,” she told members of the Columbia Savin Hill Civic Association who had raised concerns about the traffic situation. The area has been the site of a stream of school buses coming from the nearby depot and ongoing construction efforts as part of the $15 million rebuilding of fifteen intersections along the avenue. In response, transportation officials are changing the timing of the traffic lights, lengthening them on the avenue to get traffic moving, according to Feeney. Between 3 a.m. and 7 a.m., the lights will be set to flash in order to keep early-shift workers moving along. By November, new signage should also be in place to help the flow of traffic. “We understand how awful this has been for people,” Feeney said. Jim Gillooly, deputy commissioner of the Boston Transportation Department, called the intersection “complex,” and said the “crash rate” for it is nearly double that for Greater Boston. Glover’s Corner sees 1.59 accidents for every million vehicles passing through; for Greater Boston, the rate is 0.88 for every million vehicles. Gillooly added that in another month or so, the traffic signal will be connected to the traffic management center in City Hall, allowing transportation officials to observe the intersection through a camera. “Sometimes you get a backup in one direction and we can make a remote control adjustment to the traffic signal,” he said. Most of the work in the Dorchester Ave. corridor will be finished this year, Gillooly said. The project’s purpose is to improve pedestrian safety and provide new traffic signal equipment at a number of the intersections, including Peabody Square and Fields Corner, among others. He said the changes are a work in progress and further tweaks will be made. Part of the problem, Gillooly said, could be the transition from an old signal -- the lights flashing constantly, which is out of step with federal guidelines to reconfigured lights. “We’re trying to figure out if there are any specific times of day that are worse than others,” he said.